Trying to lose weight? I sure am! But it sure does not happen overnight. It takes a lot of will power, self-discipline and proper diet. 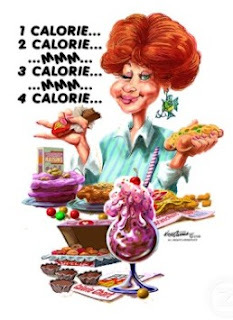 I read that in order for your weight loss program to be effective, you must be aware of your calorie intake. That is where calorie counters come in handy. Using calorie charts allows us to track our food intake. It helps to systematize the process of dieting. One must keep in mind that you have consume less than you burn. Did you know that you have to burn an extra 3500 calories in order to lose 1 pound? For me, that means a lots of hard work and discipline. I found this basic tips from Barry Danser's Wake Up and Breathe! blog and thought it worth sharing here. 1. Don’t supersize your meals. Okay, McDonalds has technically removed the Super Size designation, but now they want you to order large portions. One of the biggest advantages to calorie counter charts is that you must record just how many calories that large fry has. Perhaps that will make you decide to choose the small size, or go without. 2. Rather than having 3 big meals, eat several small portions each day. Having an egg and an orange when you wake up, an apple and a slice of cheese at 10 or 11 a.m., three ounces of tuna with a green salad at 1, a snack of yogurt at 4 and a small dinner of a steamed chicken breast and broccoli will keep you full all day with fewer calories than a more traditional food plan. You can keep track of all of this on your chart to make sure that you don’t go over. 3. Make sure you stay on top of your calories consumed and also keep track of your calories burned. When you record everything on your chart, you will begin to lose weight. 4. Figure out how many calories you need to maintain your weight, and drop a small amount below that. If you normally need 1800 calories, don’t drop to 1200 just to lose weight quickly as you will slow down your metabolism. A 1500 calorie diet would be about right. 5. You can’t eat what you don’t have on hand. Therefore, you should never shop when you are hungry. 6. Eat slowly. You will consume fewer calories when you take the time to enjoy your meal. In our fast food culture, this might be hard to get used to, but your waist line will appreciate it. 7. Be gentle with yourself. Sometimes a donut will find its way onto your calorie counter charts. If you cheat with a small item once or twice a week, you may actually last longer on the diet. What Shade of Lipstick Are You?